This is my mom’s focaccia or signature appetizer, it’s what they call in the region she is from in Italy “crescia”. Different regions have different ways of calling the same thing and crescia is more like the local name of a focaccia, since local dialects are very much still spoken in Italy, and that is the first language I learnt how to speak. No wonder why when I started going to kindergarden in France, no one would understand me. She serves this as apéritif with prosciutto, other cold cuts and cheeses. You can stuff it with mozzarella and tomatoes, prosciutto and pecorino, or anything you like. I added some spelt flour to the dough as a little twist. Focaccia in Italian or Fougasse in French, (mainly consumed in the South of France) are very similar, it’s a base of bread dough with olive oil in it and topped with olives, and other local products. This is a version of the traditional focaccia, that has been quite popular when I have guest over for brunch or apéritif with olives, salami and cheeses. Mix both flours in a container. Dissolve yeast in 1/4 cup lukewarm water. Let it sit for about 5-10 minutes. Slowly add yeast to the flours, add the rest of water, mixing progressively, add olive oil, and Kosher salt. Mix well to form a compact dough. You might need to check if the dough is too hard, add water, but don’t make it too liquid either, it needs to be elastic but not sticky. You need to knead the dough for minimum 10 minutes, until the dough turns elastic and smooth. Place dough in a container and cover with a towel, let rise for about 2 hours, then knead the dough again and let rise for another hour minimum. Knead the dough once more, then place in a tray, and spread with your fingers to get a 1/2 inch thick dough, then with your fingers, make wholes in it, all over the surface. Add pieces of onions and rosemary in the holes. Sprinkle with olive oil and rock salt. Let stand at room temperature for about 30 minutes. Cook in a pre-heated oven at 370F for about 20-30 minutes. Let cool and cut in small cubes, or larger pieces to stuff them with the ingredients of your choice. 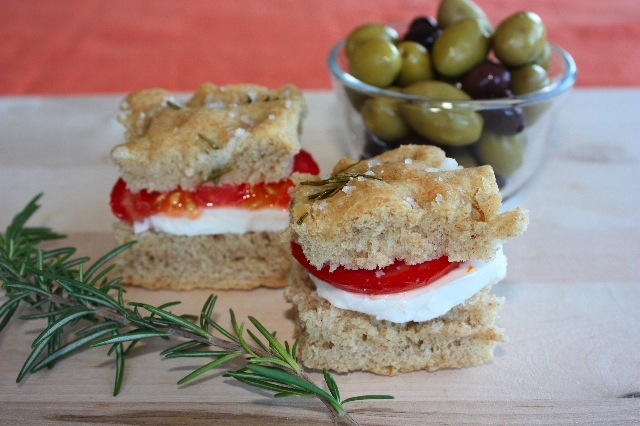 This entry was posted by silvia on August 13, 2009 at 5:02 pm, and is filed under Appetizers, Breads. Follow any responses to this post through RSS 2.0.You can leave a response or trackback from your own site. yes, spelt! the building block of rome! 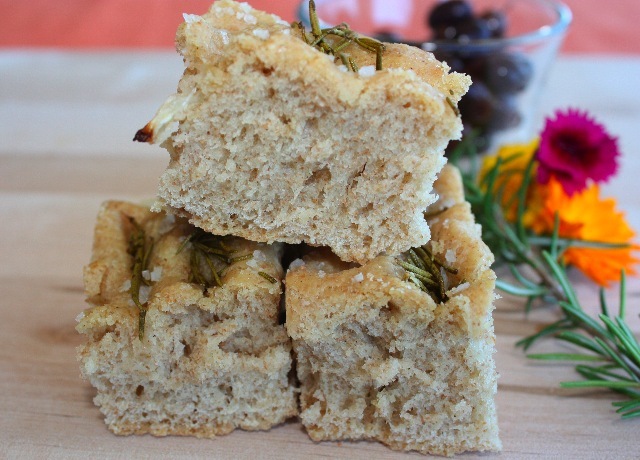 That is one great looking focaccia! By the amount of rosemary and salt on top, I can tell that this is so tasty. I love focaccia. I’m always looking for new recipes. My boys love to use focaccia for panini sandwiches. Thanks Laura, focaccia is very flavorful, kids like it in general. The kindergarten line is very funny. 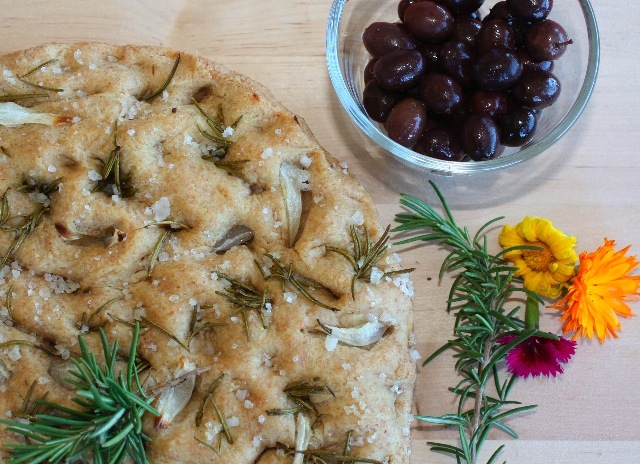 Your focaccia looks really great. Ahahah you have quite an expert eye! Thanks so much! it’s true though. This looks and sounds wonderful. Now can I have one of these little sandwiches??? YUM! I love focaccia! This sounds delicious! Am I missing the amount of yeast called for?